When you think of jetpacks, your first thought is probably an image of some fun, carefree piece of pop culture like The Jetsons or James Bond. 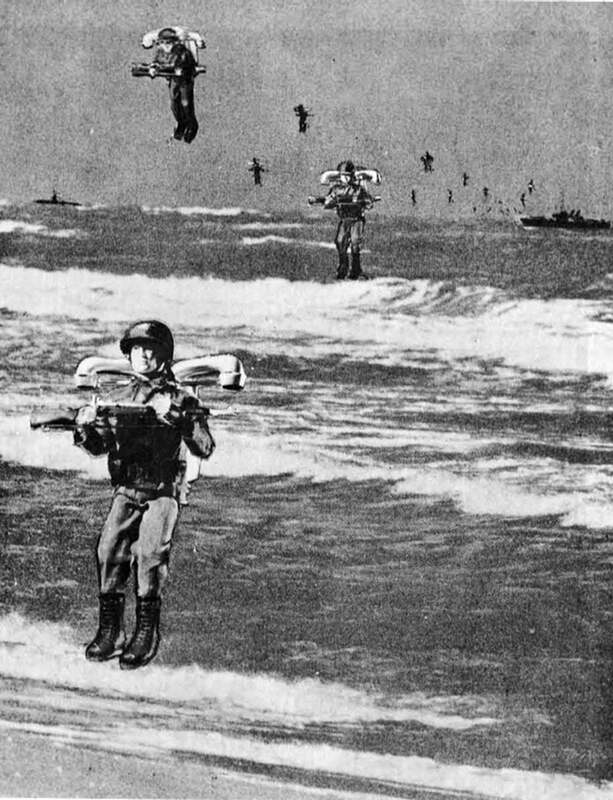 But jetpacks were serious business for the US military in the 1960s. And, believe it or not, there were plenty of futuristic ideas that involved deploying jetpacks on the battlefield in Vietnam. 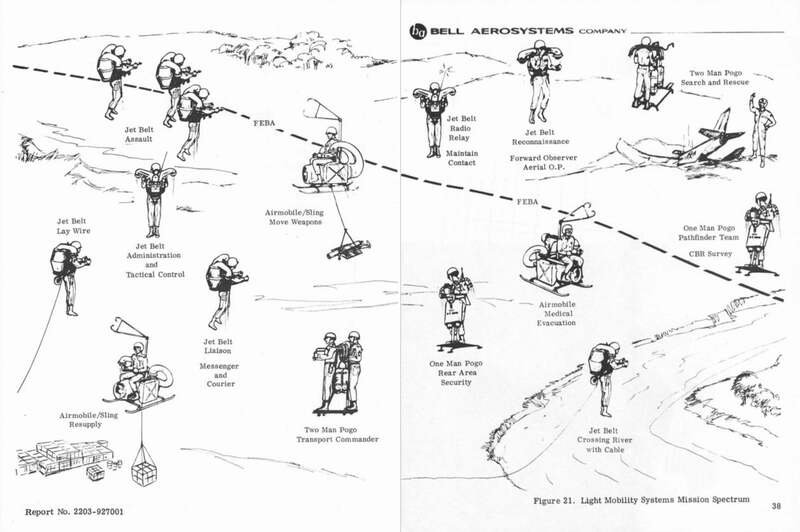 Bell Aerosystems developed a planning document in 1967 that laid out how the company imagined that jetpacks (a class of military vehicle that they called a Light Mobility System or LMS) could be used in combat. Bell, a contractor for the US Department of Defense, had been working on the Bell Rocket Belt for years, and after 3,000 flights it had developed a new jetpack-like device called the Jet Belt in 1968. An illustration from the report labelled “Reconnaissance or Hit-and-Run Missions” imagined US servicemen landing on the beaches of Vietnam. The report noted that if soldiers operating reconnaissance missions were to be armed they’d have to be carrying weapons that had as little recoil as possible. Presumably, too much kick would cause a soldier to spin wildly in the air. While the movie is fiction, music was sometimes used by Americans on the battlefield to confuse the enemy. That scene certainly would have played differently in the cinema if the music was coming from a fleet of George Jetsons. 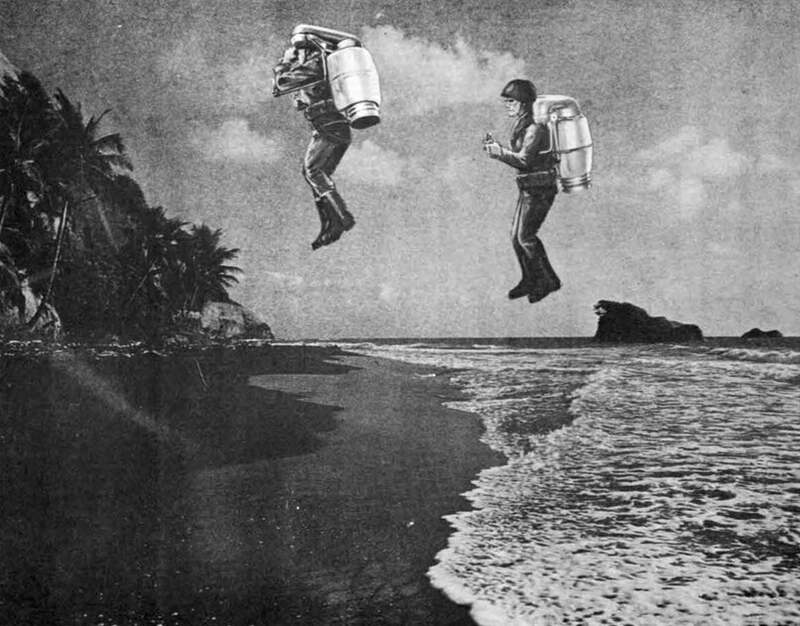 The report highlights other benefits of a jetpack system in war, such as the ability to quickly escape enemy forces and its potential use in search and rescue missions. But it didn’t imagine that this futuristic tech would just be defensive. Page 22 of the report gets to how the jetpack would be used in an assault capacity. A large number of troops could be positioned on or near the objective prior to the enemy recovering from the preparatory fire. The speed and aggressiveness of the assault would maximise the surprise and shock to the defending troops. The LMS could provide the mobility required to clear buildings and built-up areas of enemy forces. Due to the short range, navigational assistance should neither be required nor would it be practical during the assault. Communications may be needed to maintain close control and initiate any manoeuvre changes. The LMS can be used in connection with the movement of and the target location for armoured units. 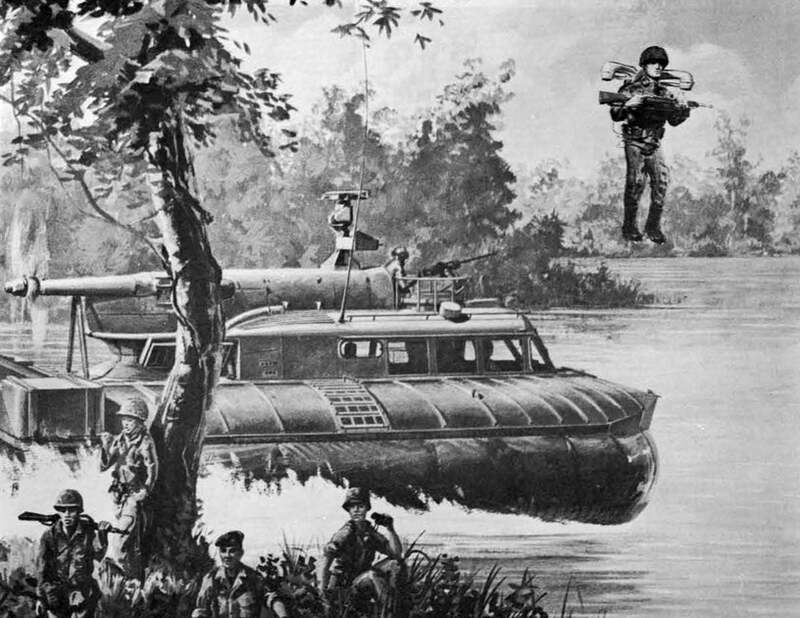 In an illustration with the caption “Assault from Offshore Ships,” we see a mock-up of troops carrying their rifles into battle as they zip to shore using jetpacks. The report emphasises the benefit of “hit and run” attacks, as well as the use of feints—quick and limited attacks that are used primarily to distract the enemy from the main attack that would happen somewhere else. The report explains that “the speed and mobility would allow immediate disengagement and preclude extended fire fights with stronger elements. The most opportune time can be used for withdrawal or redirection of the attack.” And that all makes sense. Because if you want to draw attention to something meant as a distraction, why not call up the Rocketeer? The report also explains that jetpacks would be great for use in chemical and biological warfare, something that the US engaged in regularly throughout the Vietnam War with Agent Orange and other chemicals, despite ethical concerns. The LMS would be useful for small-scale chemical missions such as riot control agent delivery or laying smoke screens. The use of tear gas in counterinsurgency operations has proven to be quite successful and the LMS would, provide a rapid responsive and accurate delivery system. The jet turbine engine can easily be adapted to operate as an efficient flying smoke generator. Here again we would have a rapid response system capable of screening small scale movements. These operations may be within range of enemy fire. If the radius of operation is small navigation assistance may not be required, however, movement to the area of operation may require navigational assistance. Communications may be required for coordination and direction. A two-page illustration visually highlighted the versatility of this military system of tomorrow—from its use for medical evacuation to its ability to do something as simple yet critical as laying cable across a river. 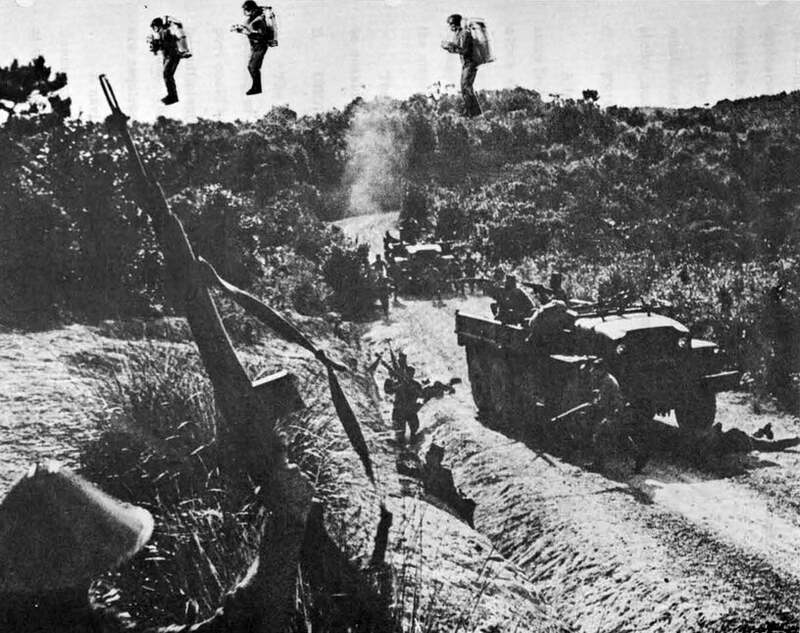 As far as we know, jetpacks were never tried in a combat situation in Vietnam. But there were plenty of other futuristic ideas that were still to come. For example, the US military spent over $3 million (£2.3 million) per year in the late 1960s and early 1970s on experimental weather-control programmes in Vietnam in an effort to cause landslides and wash out river crossings. Called Operation Popeye, its success was mixed, but it showed that the Americans would stop at nothing, even manipulate the weather, to avoid admitting defeat—something that we now know was clear to US Defense Secretary Robert McNamara as early as 1965. The US also spent roughly $1 billion (£762 million) per year from 1968 until 1973 on a futuristic program called Operation Igloo White. The idea was to create a “virtual fence” using high-tech monitors and drones to attack the North Vietnamese. And while it was a colossal failure, it did lead to technologies that would eventually be brought back to the US to be used along the US–Mexico border.